Consider Local offer a range of packaged services to help you maximise your web presence. The following packaged services cater for the adverage web requirements and allows for up to 30hrs of design work wich is usually adiquate for most standard websites. We recognise that one size does not fit all, so for those websites that require more time, we charge any extra time at our standard rate of £35p/h. Our CMS of choice remains JOOMLA however we can build your website on many other CMS systems on request including Wordpress. This will allow all customers to change their own content if required. This enables all clients to manage their disc space on the server at a higher level including access to email account setups, statistics and much more. Revisions and additional design requirements are subject to a ‘fair and reasonable’ policy. Total billable time is restricted to 20 hours within the package (normally ample for most websites). Notification will be provided when the limit has been reached. Any further hours will then be billable. Standard renewal fee for ongoing maintenance is £195. We will also perform security updates to your website CMS making sure it is updated to the latest version. Title tags - The title tag for every page will be automatically generated using the menu item name and a prefix that contains a keyword or phrase. Title tags will be unique for every page. Description tags - A generic description tag will be written with the keywords in mind and made to make a 'readable' description of the business. Content - The content on the home page is checked to make sure keywords are more prominent. Any content created by Consider Local will not however be copy written at this stage. Search Engine Friendly (SEF} URL's - SEF url's will be automatically generated adding the page titles within them which should include keywords/phrases. Cache enabled - Unchanging elements on the website will have a cache enabled so code will not have to be 'looked up' every time increasing load speed of the website, a factor in SEO. Search Engine Submissions - Sitemaps are submitted to all major search engines including Google, Yahoo & MSN. 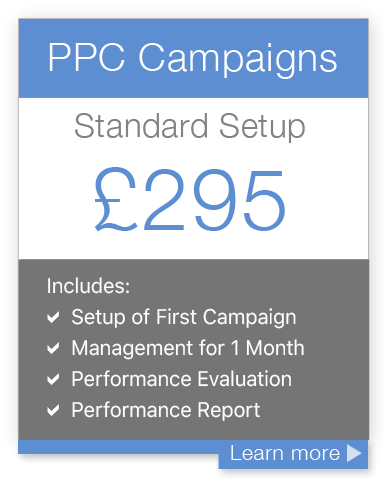 We are experienced in developing Pay Per Click campaigns for local businesses. This includes setting up Google AdWords and Facebook advertising. Please enquire for further information. The advantage of PPC is that you will be able to get laser targeted traffic to your website. It is also means you can get instant traffic, rather than spending months of on-going SEO strategies to achieve the same. Campaign management for 1 month! To help your website perform better, particularly for local based search queries, we offer Stage 2 SEO. This more involved SEO work is particularly ideal for products and services where the competition is more fierce. Unique Meta Tags per page (includes 5 pages). This will improve SEO performance and enable each page to compete for search terms. Consultation on how to further improve content. Take Your Online Strategy Even Further With SEO Stages 3 & 4! Take Your SEO Strategy Further! Take your SEO strategy to the next level with SEO stages 3 & 4. Social Media Setup (Setup and branding of Facebook, Twitter, Instagram and LinkedIn. We will also help you streamline the management of these pages using Hootsuite. Training is also available. As the needs of each company vary so greatly, we simply charge at our standard hourly rate (£30 p/h).